Imagine this – You have a biology blog. You started this blog to help college students who are struggling in biology. A student in Timbuktu goes to Google and searches for “how to pass biology.” Guess what shows up as number one? A blog post you wrote on 7 Tips To Help You Pass Your Biology Classes. The result – Free traffic. Imagine that there are thousands of other searches that you rank for. This is not something I’m imagining. This is a reality for my biology blog. The result is that 91,410 people have visited that blog 101,457 times in the last month. Search engines were responsible for sending 80,144 of those visits. 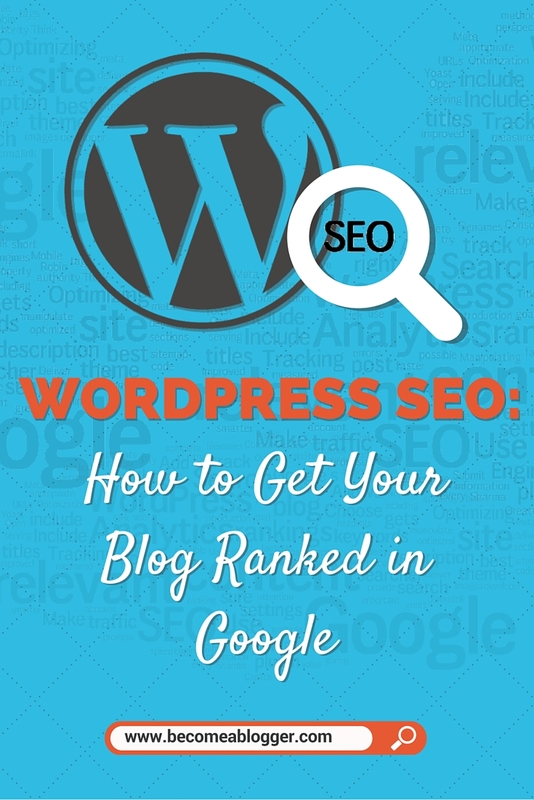 I’m going to share how to optimize your WordPress blog for the search engines. The result – you can get some of that good ‘ol free traffic. Before we dive into how to optimize your WordPress blog it's important for you to understand what SEO is. When you build a blog, one of your main goals is to get people to come to that blog (or it would get pretty lonely). There are many strategies for driving traffic to your blog. You can use social media sites like Facebook and Twitter. Or get other bloggers to send their visitors your way. Some bloggers even get exposure on the news and other forms of traditional media. One of the most stable ways for getting exposure is by having search engines (i.e. Google) send you traffic. Know what the individual pages/posts on your site are about. Match that information with what the searcher is looking for. Google is a smart cookie. They have complex algorithms in place to be able to determine the relevant information. But to understand SEO, I want you to picture something – Imagine landing in a foreign country. Everything is new to you. You are good with finding your way around. But there's something different about this new place. There aren't any signs ANYWHERE. You're walking all over trying to determine where the restaurants are but have to rely on other cues. You're trying to find the restroom in the restaurant, but all you see are random doors. You open one door and discover that it is a restroom, but it's the restroom for the other gender. You are lacking vital information that's necessary for you to make crucial decisions. You finally figure out where things are, but it was much harder than it needed to be. If there would be signs everywhere to guide you to the places you're looking for, it would be easier. In this analogy, you are Google and that new country is your Blog. Google is smart (just like you) and can figure out what your site is about (to a certain extent). But wouldn't you want to make it easier? Wouldn't you want to put up the right signs to give Google EXACTLY what they are looking for? Wouldn't you want to make it so easy that you are giving Google a detailed map, or even GPS to navigate your site? That is Search Engine Optimization. 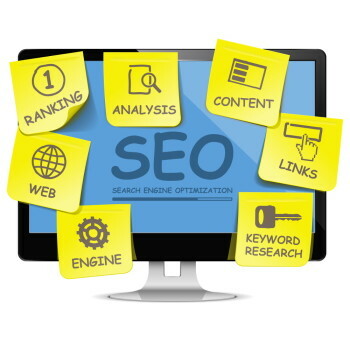 You are optimizing your website to give Google the exact information they need. This makes it easier for them to index your site and serve you up to the relevant searches. Let's think about the typical searcher. This person has a question or is looking for specific information. They go to Google (or another search engine) and type in a certain query and click the search button. Once they do that, they go to an initial page of 10 results (and maybe some ads). This is the Search Engine Results Page (SERP). They browse that page and click through to the page that seems most relevant to what they are looking for. If the page is relevant, they are happy. If they are happy, they may even check out what else that website/blog has to offer. If they are unhappy, they return to Google and check out the other sites and even perform other searches. Google's ultimate goal is simple: to give the searcher exactly what they are looking for. So then what should be your goal? To give your readers (and potential readers) exactly what they are looking for. You're may be expecting me to say no, but the correct answer is yes. In fact, there are entire industries that focus on manipulating Google. Think about it. If you can trick “the machine,” you can get a lot of traffic. I've received a lot of emails from individuals and companies promising to help me get to number 1 in Google. Of course, there are fees involved. My recommendation to you is simple – NEVER try to manipulate Google. Why not? Because Google is pretty smart and they are always improving their algorithms. A quick win today that's based on shady principles can end up screwing you over in the long run. I've seen many businesses disappear overnight because of such shady practices. Are you serving your audience as best as you can? 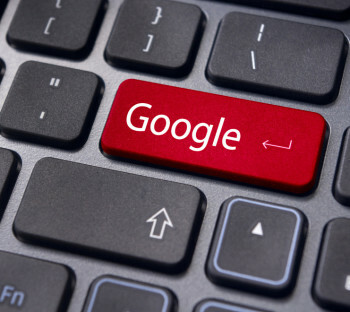 Remember – Google wants to give the searcher exactly what they are looking for. This leads to my number 1 tip for optimizing your blog. Don't optimize for Google, optimize for your readers. Serve your audience and you will end up serving Google. Create great content. The Internet is a noisy place, but cream always rises to the top. Don't skimp on quality. Create something great. Create relevant content. The more content you have on one specific topic, the more you will establish your blog as a leading authority. Give Google what they want. It's good to have awesome content on your blog. It's even better to set it up in a way that gives Google the information they need to make ranking decisions. Establish your authority. If you are doing points 1 – 3 consistently, you are setting your blog up to become an authority. And the more you connect with other people in your niche, the more you will be recommended as an authority. If you follow my training on building a blog, you are most likely using WordPress. If not, watch this video. One of the key principles of SEO is that you should give Google as much information as possible. This will help them make better decisions on how to rank your site. If your blog post is on how to make ice cream, ?p=123 doesn't provide valuable information. See what I did there? I gave Google more information, even in the URL. We will then have the option to change your permalinks from the default to “post name”. Make that change. One of the great things about WordPress is that you have a wide variety of themes to choose from. However, all themes aren't created equally. Make sure to choose a theme from a trusted vendor. By doing this, you will help to ensure that the structure of your blog will be relatively optimized on its own. Also, this will help with the next point. Don't you just hate it when you try to load a site and it takes forever? So does the rest of the world. Remember that Google wants the searcher to be happy. If your site is slow, your visitors won't be happy. If your visitors aren't happy, Google isn't happy, and they will make adjustments accordingly. Use a site like GTMetrix to analyze your site speed, and if it's subpar, make the recommended changes. Choose a theme that isn't “bloated.” Poorly made themes take longer to load. By choosing a trusted theme developer, you are reducing this risk. Reduce the image file size. The larger the file size, the longer it takes to load. That's never good. Upgrade your hosting. If your blog has grown to where your traffic is putting a heavy load on your server, it might be time to upgrade. I recently switched to WP Engine hosting and it made a HUGE difference in my site speed. Use a Caching plugin. This leverages browser caching that saves your site so that it loads faster when a visitor returns to your site. A good plugin for this is W3 Total Cache. Remember – faster is ALWAYS better. This is a powerful plugin that allows you to take control of how your content shows up in Google. It also allows you to determine how your content shows up on social media, but that's beyond the scope of this post. For more on how and why I use this plugin, read this post. Click here to find out more about the plugin. When you install the “WordPress SEO” plugin by Yoast, it gives you the ability to customize how your post will show in the search results. Right below the post editor, you have the ability to see how optimized your post is for a focus keyword. In a perfect world, what would someone search for to get to this post? Include that keyword phrase in your title of the post. Try to include it in at least one article heading. Include it in the URL of the post. Include it a few times in the content of that post. Include it in your meta description. Please note: I'm not telling you to add that keyword everywhere in an artificial way. It's actually quite simple. If you're targeting a specific keyword, it will show up naturally in your content. Use short paragraphs. Attention spans are getting lower and lower as time passes. Also, many people are browsing our sites from mobile devices. Keeping paragraphs short makes it easier to consume on the go. Break content into relevant sections. If you scan this post, you will see various sections with various titles. This makes the content easily scannable and allows you to get a quick idea of what it covers. Include relevant images and name them appropriately. Images help to bring your content to life. Include them in your content and name the files appropriately. This gives Google even more information even down to the file names. When you add images, include relevant alt tags. Link to relevant content. Remember our goal – to serve our audience. When someone reads your content, they may have questions. You can help answer questions by linking to other helpful information. This might be your own content or content from other sources. As you grow your blog, if you use the principles I share above, your site will grow in authority. As your authority grows, Google will start sending you more and more traffic. As a business owner, you want to make sure that you are always measuring key factors. When it comes to traffic, there are some great FREE tools you can use to measure progress. Google Analytics provides you with all kinds of great insights for your blog. It gives you a detailed breakdown of where your traffic is coming from, including the searches that are driving traffic to your blog. When you install Google Analytics, you will have to create a property in your account. It will then give you tracking code to add to your site. You can do this in most theme settings. If your theme doesn't have that option in the settings, you can use the “Google Analytics by Yoast” plugin. Google Search Console (formerly Google Webmaster Tools) is a free service that allows you to monitor and maintain your presence in Google's search results. This is where you get to chime in on this content. Which of these tips have been most helpful for you? Is there anything I missed? Feel free to share below. GT Metrics – grades the performance of your site by analyzing it. WP SmushIt – helps compress the sizes of the images in your posts. WP Engine – offers optimized hosting that’s optimized specifically for WordPress. W3 Total Cache – a caching plugin that leverages the caching feature of your browser to improve user experience to your blog. WordPress SEO by Yoast – it gives you full control over how your content is going to show up on social media, in the search engines, etc. Google Analytics by Yoast plugin – allows you to connect SEO by Yoast to Google Analytics and track all of your site's performance details. Google Analytics – a powerful service offered for free by Google that gives you all kinds of insight for your blog, for your traffic, not just for search engines but for social media traffic and how everything is performing. Google Search Console – (formerly called Google Webmaster Tools) – It gives you all kinds of details. 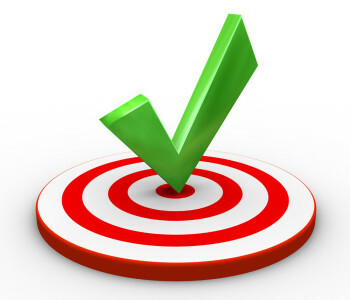 It allows you to submit your site to Google and allows you to track your rankings and any errors. You are by far the most generous person on the internet! Yes, most people want a fee for the information you provide freely! You are a wonderful, charitable human being!! We need more people like you on the planet. 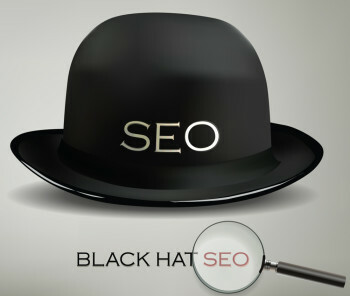 I am an SEO, content and usability guy and can say that this a very good and useful post, thanks for all the effort. 1) In addition to adding keywords to the content, also add synonyms. Google is very good with synonyms. As you already said, make sure it’s good for the reader. 2) Very good suggestion about breaking the content into sections. My recommendation is: use a “Header 2” (H2) or “Header 3” (H3) for the section headers. This will allow people to scan the sections more quickly and gives Google even more queues as to what the post is all about. Just make sure to use the appropriate keywords in the headers too. 3) As you mentioned, not all templates are created equal. A template should be coded in very lean HTML5, and should have standard HTML5 markup that once again is more info for Google. 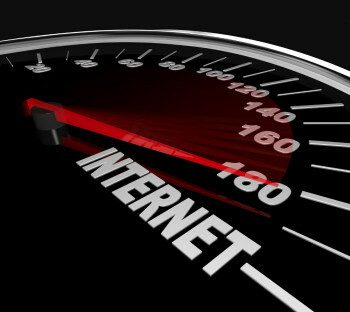 As you said, speed is key and is actually built into Google’s algorithm as a ranking factor. 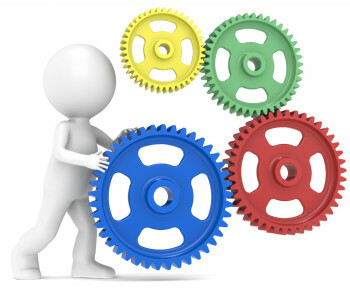 4) Use Open Graph markup for each post, here is a plug-in: https://wordpress.org/plugins/opengraph/ this will also help Google to better understand what you’re offering. 5) There is other markup that can be done to give even more meaning to the content, as well as visibility to social media. Let me know if you want to hear more. 6) Always enter a Meta Description for each post. Google generally takes this for the SERP listing. This means write the description in a way that would make people want to click on your link, not the other ones. By the way, this has no effect on SEO, but has a big effect on whether they click on the link or not. 1. Exactly – it all comes down to being good for the reader. If you are doing that, synonyms will naturally occur. 2. Yep, that’s what I use. In this post, for example, I use H2 for the main headers and H3 for those that I consider “subheadings”. 4. I use the WordPress SEO plugin to accomplish the same thing. I love that it does so many things in one simple plugin. Sorry I can’t help getting too technical sometimes ;-), By the way, I’m now signed up on your blog and looking forward to the installments of videos and tips in the future. Thanks for all your efforts! I was glad for your comment. I hope you didn’t read into my comment and think that I didn’t value your input. The reason I responded with such a long comment was because of the fact that you took the time to add value to my content. I really was asking about the additional info you said you could provide because I want to know what that is – specifically about the other markups that can be used to optimize your site even more. It’s always good to learn more about these kinds of things. the “ultimate goal” of google is not to serve the people searching. not to appear too businessy, but google is a for profit business. the ultimate goal of google is to grow profits. they make money by selling advertising. their main platform to do that on is their search engine. to connect potential buyers with sellers. 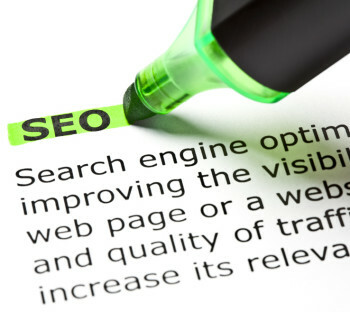 a way they support that strategy is to have searchers want to use the service. a way they do that is to create a satisfying user experience. more like a way for them to accomplish their ultimate goal. LoL, not picking on you, i love you and your work. and why google does the things they do. You make a good point. Google is a business and they are in business to make a profit. Can’t argue with that. So what you’re saying is correct. However, for me – I’m focused on Google’s goal when it comes to the content that I provide. You said it right when you said “I know what you meant, in the context of this information”. And that’s all I was referring to. So yes, Google wants to give people what they want so that Google can make more money. I guess you can argue the same for me, depending on how you look at it. I say all the time that my main goal is to help others with my blog. But if you think about it – the reason I’m doing that is so that I can grow my platform and feed my family. I guess you can say that my “ultimate goal” is to feed my family, but in the context of this blog, I think my “ultimate goal” is to serve my readers. That’s the way I look at it. But I really do appreciate your perspective. Like I said, you’re right. But I’m looking at it differently. Helps me to focus on what’s important. Would love to know what you recommend as the top five, or six or ten or whatever you think is the GA data to look at consistently? It turns out that Google Analytics is a hot topic for my listeners. A few people have messaged me about it. There’s so much available inside Google Analytics and I can’t wait to explore it more here. I think the other thing that’s helpful is optimizing each page. I haven’t done that. I optimize each post but I sort of leave the pages to themselves because they don’t have a lot of writing on them. Everything else you recommended I’m doing (to the best of my ability). It’s stuff I learned from you through the coaching community. Thanks again for taking that extra day. This was a super robust podcast episode and I appreciate it. Sherri, wow – thanks for the feedback. Glad to hear that you enjoyed this one so much. I’m also glad to be able to help you out in the Coaching Club. You are doing great things and I can’t wait to see how you grow over time. WPtouch would be great add-on to create a mobile version of your website. It has built-in support for eCommerce, mobile-advertising, custom content, and most importantly it allows you offer an app for your site without the App Store. This is an absolutely amazing post. I am trying to update a blog that gets a fair amount of traffic and this has been very helpful. I have a question about permalinks. My blog has been around a long time and has established links with other sites . Would changing the permalink disrupt those links and perhaps even my Google ranking? Could I wind up hurting myself by changing that this late in the game? I have over 700 posts over about 5 years. 1. If your site is indexed in Google, it could POSSIBLY be affected. One way to get around that is to create redirects for all of the old URLs to go to the new URL. 2. All of your social share counts will go down to 0. That would be a HUGE loss in social proof if people have shared your content in the past and you show those numbers. If reason #1 was the only issue, I would consider doing it, but reason #2 is a killer for me. That social proof is powerful. People judge your blog by the number of shares on your posts. So, you’re already indexed and getting a fair amount of traffic. Just leave it as it is and optimize all the other aspects. Hello Leslie. Im a new reader on your blog. My english grammar is not that good, but I hope that you will understand my ideea. First of all , the analytics article is a great ideea. I’ve been struggling for years to understand the mechanic of this tool. No succes yet and I feel that your article may help me . So , +1 vote for that. As a second ideea, I own a little business, an WooCommerce website and I find the SEO process so hard , even with WordPress as the primarly managing tool. I tried to use the Yoast Seo tool , but some features are missing, like the social facebook description. In my judgement, nowadays, the social media advertising is a strong SEO tool, and Yoast just does not have it. Could you give me some tips for my little business website? Only if you have some free time. Oh yeah, thank you very much for this interesting article, but Im still waiting for the analytics one. I cannot answer your questions better than Leslie can. So I’ll let him respond. But I will say that it sounds like you would benefit from being a part of the coaching community that Leslie runs. It’s been a HUGE help for me. I’m in my 2nd year of blogging and I can honestly say that Leslie has been a HUGE part of helping me figure out what to do and when. Definitely learned a lot Leslie! I think The GTmetrix, cache plug-in, and switching hosts will help me create the biggest changes in my website. Awesomeness. Let me know how it goes for you if you make those changes. Thank you so much for this post, Leslie! I have actually managed to verify my site now and it was thanks to your easy to follow video. The first time I tried, I had no clue as to what I was doing, so I gave up. Then I followed another how-to, but it was missing one crucial piece of info that you gave – waiting a few minutes for it to process, so I thought that the process had failed and gave it up as too hard again! Woohooo, I love that Wendy. Thanks for taking action and congrats on getting your site submitted. Very powerful and informative episode—truly amazing. Glad you got so much value from it D.
It also does Open Graph and Twitter cards. So I think that would cover it, unless there are specific elements that it doesn’t add. Is my first visit to your blog. I am struggling with my traffic for my new blog. Thank you very much for the pointers. I will put it into action one by one. This blog is really awwwwwsommmme. Thanks. Hey Leslie, I have a question about Yoast and Google +. The image I choose to be shown on Google + in the Yoast app has not been showing up lately like it has been in the past. Actually when I go to share it has no images shown at all. Have you ran into this, and if so what is the solution? Thanks. I have run into this in the past. It seems there have been some glitches with Yoast recently. But they have updated it. It should work now. Hi, thank you for sharing your experience, I also use for my WordPress Yoast SEO plugin, and it does an amazing job (almost all you need in On-Page-Seo).